Something big is coming! That's the promise made by the 10 Cloverfield Lane tagline. Though, what that big something is remains a mystery. And we doubt they'd be cruel enough to be talking about star John Goodman. Paramount has unveiled their specially commissioned IMAX poster for this thriller, which arrives from producer J.J. Abrams. Courtesy of /film, this dark and ominous one-sheet shows the silhouette of star Mary Elizabeth Winstead trapped in a mailbox. Which only helps to further the mystery behind what is being referred to as a 'distant cousin' of Cloverfield. That's right, no one associated with this project will admit that it's a sequel to the 2008 smash hit Cloverfield, even though the trailer and teasers hint at a monstrous presence, going as far as to unleash a mighty roar over the footage's soundtrack. This poster, which was created exclusively for IMAX audiences, is from UK artist Kevin M Wilson, who likes to impress all the hipsters with his cool pseudonym Ape Meets Girl. In the past, he has created exclusive posters for Back to the Future, Jaws, and The Incredibles. But this might be his coolest one yet. Ape Meets Girls loves to hide Easter eggs in his art. And there are many to discover in this awesome one-sheet. Though, we may not be able to discover all of them before we've had a chance to see the movie. Ape Meets Girl did watch the movie before creating this piece, and while he might hint at some of the film's bigger surprises in the hidden imagery found in this painting, he's not sharing anything about 10 Cloverfield Lane's mysterious plot just yet. He does say that the trailers only scratch at the surface of what this truly is. Ape has this to say about the Easter eggs, helping to point out a few. "There are some obvious ones, like in the grass, and anyone who is following the Alternate Reality Game will be familiar with the name that appears in the post. As for the others, there are nods to the film, subtle nods, that really just appear to be part of the mailbox and the background, but once you've seen the film, you'll realize their relevance. Some of them I added myself, but others were Dan's idea, in particular he was keen to incorporate The Totally Rad Show into the image somewhere." At this time, it isn't known if this exclusive Ape Meets Girl 10 Cloverfield Lane poster will be handed out at special Thursday night screenings of the thriller. But that has been the case for previously commissioned IMAX posters such as this one. 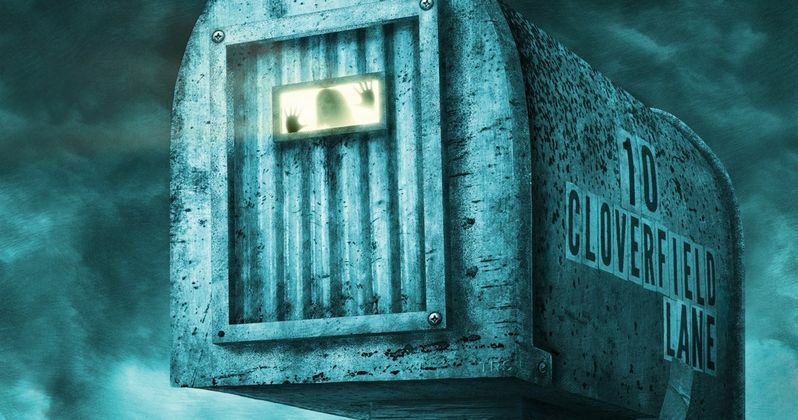 We don't have long to wait for the mystery to be unveiled, as 10 Cloverfield Lane is in theaters next Friday. The synopsis tells us that a woman (Mary Elizabeth Winstead) discovers the horrifying truth about the outside world while living in an underground shelter with two men (John Goodman, John Gallagher Jr.). What is that horrifying truth? You'll have to buy a ticket to be one of the first to find out. Just let us know if the Cloverfield monster lives!